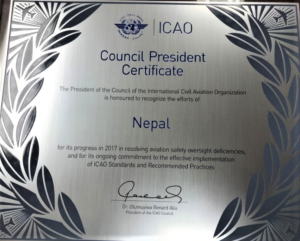 In another landmark achievement, Nepal receives the prestigious ICAO Council President Certificate for the country’s progress in aviation safety. 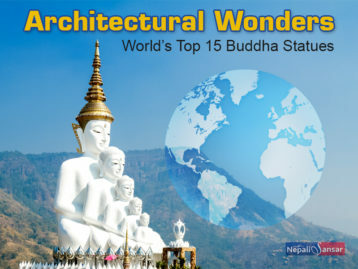 This recognition came after Nepal’s successful efforts of resolving its safety oversight deficiencies and proper implementation of ICAO safety standards and policies in the year 2017. 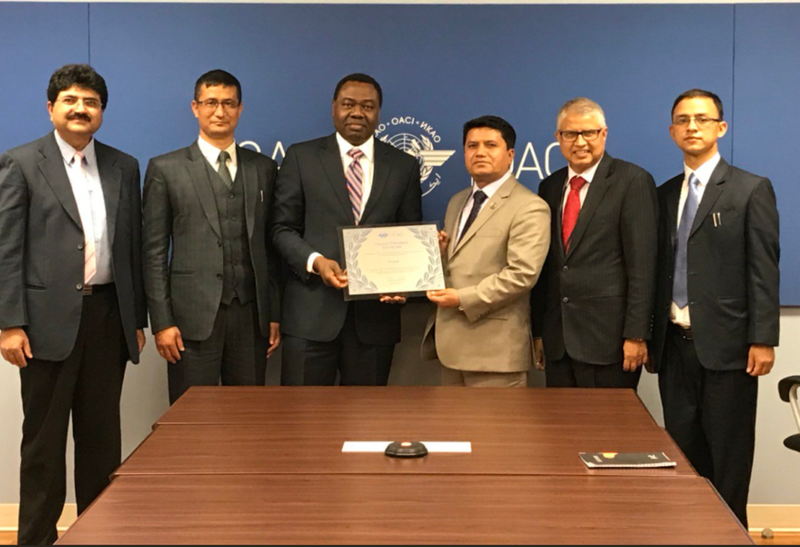 Dr. Olumuyiwa Bernard Aliu, ICAO Council President presented the certificate to Rabindra Adhikari, Minister for Culture, Tourism and Civil Aviation at the ICAO Headquarter in Montreal, Canada. 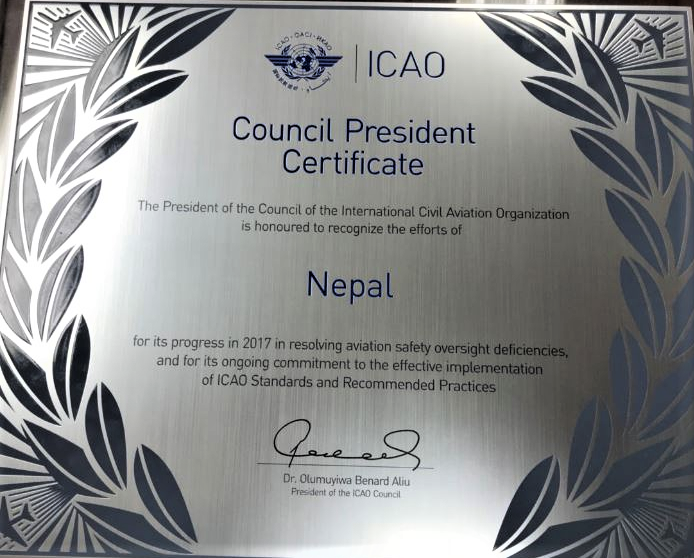 Expressing their joy, Civil Aviation Authority of Nepal (CAAN) officials say receiving the ICAO Council President Certificate is a great achievement for them, especially when the country’s aviation safety is often put to question. 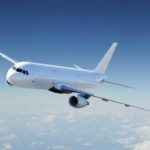 Nepal is among the 14 countries including Indonesia, Bangladesh, Jordan, Kuwait and Romania who received the ICAO certification for their efforts over aviation safety in 2017. Among other dignitaries present at the event, Mr. Sanjeev Gautham, Director General Civil Aviation Authority of Nepal was also available. ICAO awards Council President Certificate to member nations on the basis of results of ICAO Universal Safety Oversight Audit Program, Continuous Monitoring Approach (USOAP CMA) activities, including audits, ICAO Coordinated Validation Missions (ICVMs) and off-site validation activities. 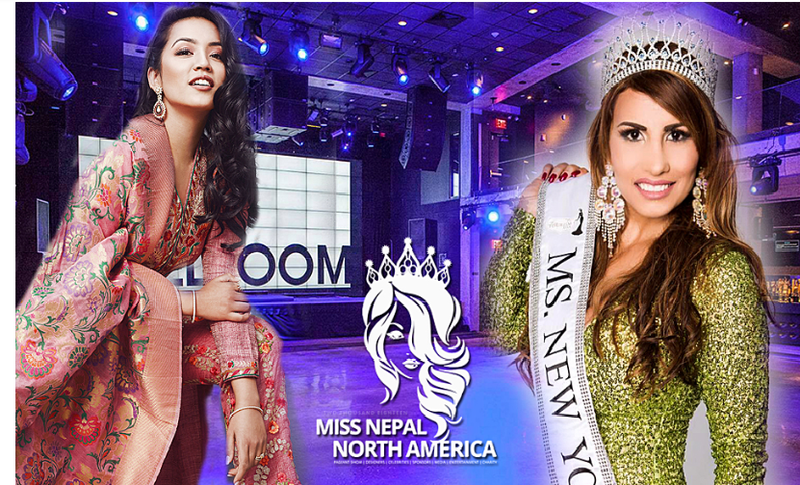 FIFA World Cup 2018: FIFA Saga World-wide, Nepal No Exception!